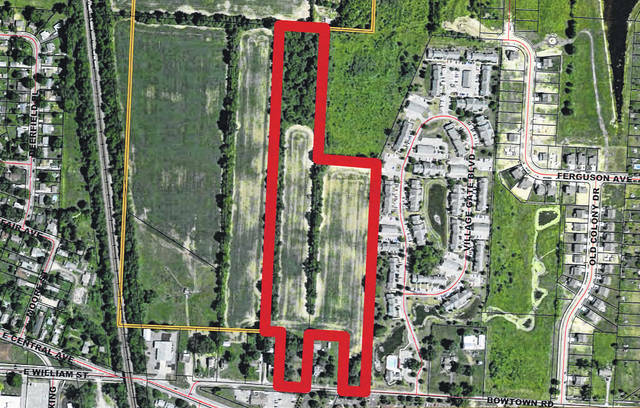 Highlighted in red on this aerial map is where Metro Development LLC was hoping to build Highpoint Place Apartments. The complex was proposed for Bowtown Road (shown to the south on the map) on the east side of Delaware. While Metro Development was successful in getting a rezoning amendment and preliminary development plan approved for its Seattle House Apartments on Monday, the discussion continues on its proposed Highpoint Place Apartments that would be built north of Bowtown Road and directly west of the Village Gates of Delaware apartment complex. At the request of Metro Development, Delaware City Council voted Monday to table the proposal so that the developer could look more into the feedback from council and give itself the best chance at a successful vote. That vote, because of the City of Delaware Planning Commission’s vote not to recommend approval of the development, would need to be a supermajority vote of five favorable votes in order for it to be approved. The proposed Highpoint Place Apartments would include 160 units on roughly 17 acres of land. The 160 units would be split between 80 one-bedroom and 80 two-bedroom apartments over seven buildings. Six of the buildings would be three-stories tall, or 42 feet, with the building closest to the existing houses along Bowtown Road only two stories. Amenities proposed include a pool, office space and equipment, a cardio center, and an outdoor grilling space. Similar to the Seattle House proposal, the one-bedroom units would 678 square feet, with the two-bedroom units totaling 933 square feet, with prices ranging from $900 to $1,200 a month. But also like the Seattle House Apartments, the Highpoint Place Apartments, as proposed, fail to meet several of the city’s R-6 base district codes. Speaking at Monday’s meeting, Councilwoman Lisa Keller said, “These are smaller than our code allows; they’re denser than our code allows; they’re taller than our code allows; and they use materials that are less than our code allows. So, it’s like a hit in every direction. And I understand when you come to the city of Delaware and you’re conceiving of a project, you know what our rules and regulations are for that project. The potential impact of traffic along Bowtown Road also continues to be a concern for both council members and residents as well, and it was also the biggest concern for the planning commission when it voted not to recommend the development. One resident —f ormer Delaware Mayor Michael Shade — told council the responsibility for fixing traffic issues is solely on the city and should not be a deterrent for potential growth in the city. A fifth reading of the ordinance is expected at the council meeting on Monday, Oct. 8. Meetings begin at 7 p.m. and are held in City Hall, located at 1 S. Sandusky St.